This exciting and varied concert will feature solo performances from three international guitarists and masters of their respective genres. They will close each set with collaborations on guitars, oud and dulcimer giving the concert a world music twist. A must for guitarists ! Learn tricks of the trade from three international players and masters of their respective genres. In three informal seminars, each player will discuss their instruments, techniques, music and much more and will be open to answer questions. You do not need to bring instruments. Originally from Greece, Stephanos Tsourelis has been awarded Best Guitarist of the Year by the London Guitar Institute. Stephanos plays jazz on acoustic and electric guitars and Mediterranean music on oud. 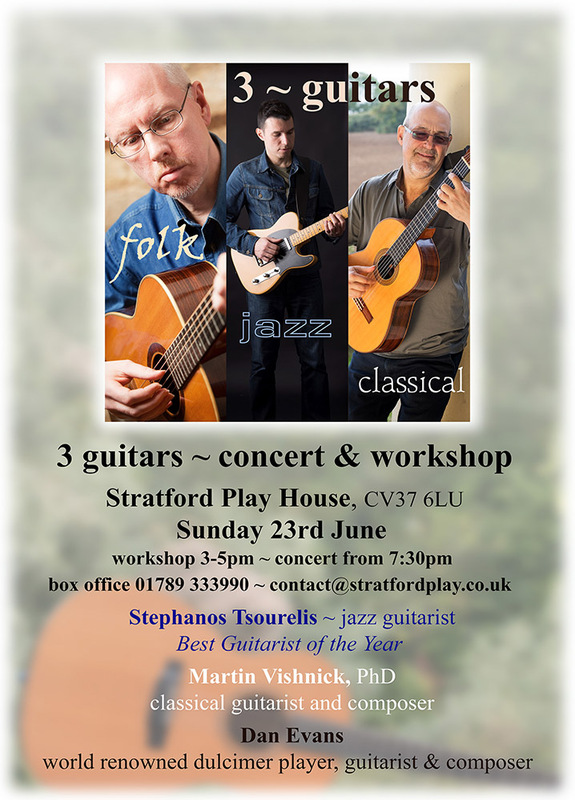 Classical guitarist and composer, Martin Vishnick has performed all over the world, frequently winning standing ovations. Martin’s PhD has researched extended techniques. World renowned dulcimer player, acoustic guitarist and composer, Dan Evans (FISM) has released 5 CD albums, undertaken 18 international tours and has recorded and performed in Nashville, Tennessee.